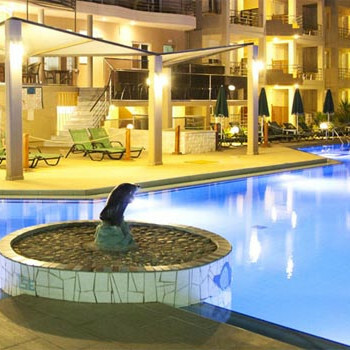 The Maleme Mare Hotel is situated at the end of a row of hotels and is superb for a family group. You will not be troubled by late night music as the area is aimed at families with younger children. There are plenty of places to eat within a few hundred yards. The local supermarkets are a maximum five minute walk away, with the nearest just round the corner. This one is the cheapest for all those pool toys. The apartments are located across a quiet road from the sand and pebble beach. This is still very much a Greek village with the locals and Greek day trippers using the beach and tavernas. Take a walk up off the main road into the Greek houses and streets and its like going back in time. Everyone is friendly and welcoming. There are two pools on site one for playing and a good onr for straight up and down swimming. The staff are friendly and the beer cold. Mikes up on the main road, best stiffado in town. The Wave, best salad and raki (if you don't know what this is you will by the time you come back). The best place to start and finish an evening is at the Mythos bar on the front next to the Maleme fish taverna. Get a seat for 6 o clock have a Greek coffee and ouzo watch the sun go down and chill. We had two rooms, a separate bedroom and a large kitchen, dining area with table and chairs plus a lounge. The rooms were very clean, the cleaners came in every day. We had balcony that was L shaped with another table and chairs, we could follow the shade round at any time of the day. We didn't like the food at the restaurant on site. The was 2 pools, one which was great for length swimming and good sun beds and umbrellas. We stayed here in 2000 and also this year in September 2006. I'd definately go back again.